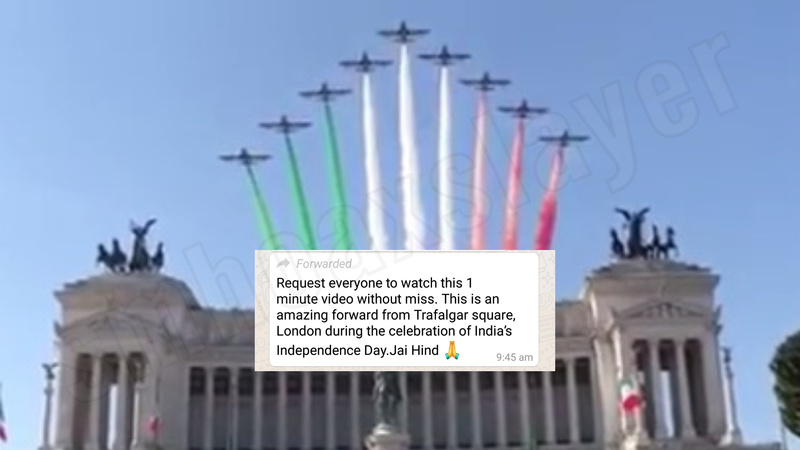 As jingoistic messages after Republic Day floated around, one of the viral videos claimed to portray India’s 72nd Independence Day being celebrated in London’s Trafalgar Square with fighter jets making tricolor in the air using colored smoke. “Request everyone to watch this 1 minute video without miss. Request everyone to watch this 1 minute video without miss. An obvious giveaway to the message was the Italian national flag fluttering in the backdrop. A frame by frame search situates the building to be in Rome, Italy – the Piazza Venezia, popularly known as the Italian Parliament. A further detailed probe revealed that there is a celebration of the Italian Republic Day on the 2nd of June every year that features the Italy’s Frecce Tricolori – the largest aerobatics display team in the world. The celebration of 2018’s Republic Day was reported by The Telegraph in the United Kingdom and Euro News, a European pay television network. The extravagance is captured from a slightly different angle than the viral video. It played the same music as was heard in the video. The earliest traceable source of the viral video is one uploaded on Facebook by Satya Balaram Gadagamma on 17th August 2018. Request everyone to watch this 1 minute video without miss. This is an amazing forward from Trafalgar square, London👇🏻..Yesterday HAPPY Independence Day To Everyone!!! However, it is not completely a manufactured lie. On the 15th of August, 2018, India’s 72nd Independence Day was celebrated in London but it was a very different kind of celebration. The Indian men’s cricket team hoisted the Indian national flag, coincidentally also a tricolor, but not the one featured in the viral video. According to News 18, Captain Virat Kohli alongside his teammates and coach Ravi Shastri hoisted the flag in outside their London hotel before leaving for Nottingham. Don’t need fake news to respect our army, we already do. Don’t use fake photos to elevate respect for Army. ← Can chanting Om project water several feet high? Pursuing Masters in Journalism from Symbiosis Institute of Media and Communication, Pune. Graduated with Mass Communication and Videography from St. Xavier's (Autonomous) College, Kolkata. Avid reader. Film enthusiast. Animal lover. Did Pakistan Shoot Down Its Own Aircraft? February 23, 2019 Shrimayee Thakur Comments Off on Did Pakistan Shoot Down Its Own Aircraft? February 22, 2019 Pratiksha Thayil Comments Off on Did the Saudi Prince comment on the Kashmir Issue?